A classic palm in the PNW. 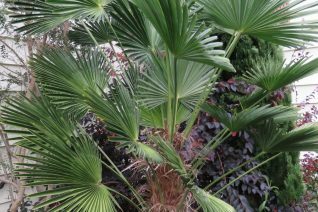 Windmill Palm or Trachys as they are also known are extremely popular. And they should be. 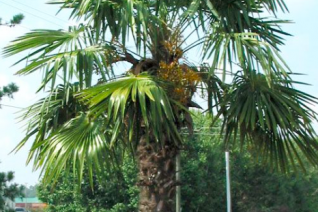 Moderately fast growing palm to about 18′ tall in 10 years. The trunk is covered in fur and this acts almost like insulation to protect the interior meristem from cold. Very cold hardy to near short dips to 0ºF- many venerable and ancient Windmill Palms can be found in old neighborhoods having gone through the very worst winters of the last 50 or more years. The fronds usually have drooping filifers on the species but that can vary. Male and female and requires one of each for viable fruit set. Following huge aromatic cream colored flower structures pollinated berries drop and will often germinate in open ground. Full sun to full shade. Drought tolerant but regular irrigation in rich soil will speed growth. Excellent performance in tight spaces. Occasionally young palms become nitrogen starved and turn yellowish. To correct simply feed with all organic fertilizer and mulch and water well through summer.